This post contains affiliate links. When you click + buy, you help me buy a churro or 13. Yay! Remember this? Your physics teacher tells you to turn to page 137 of your 7-pound textbook. He rattles on about a formula, a chart, and something about acceleration and magnitude. You try to understand it, but you find the “hugs not drugs” posters on the wall much more intriguing. Yawwwwnnnn… So, how do you make learning science FUN AND EXCITING? 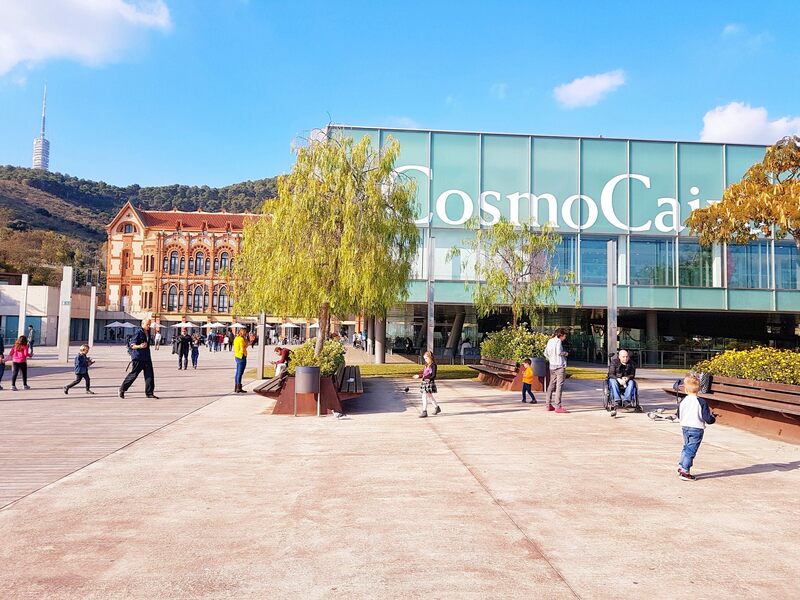 You go to CosmoCaixa, the largest interactive science museum in Barcelona. Of course! Is it really a kids’ museum? 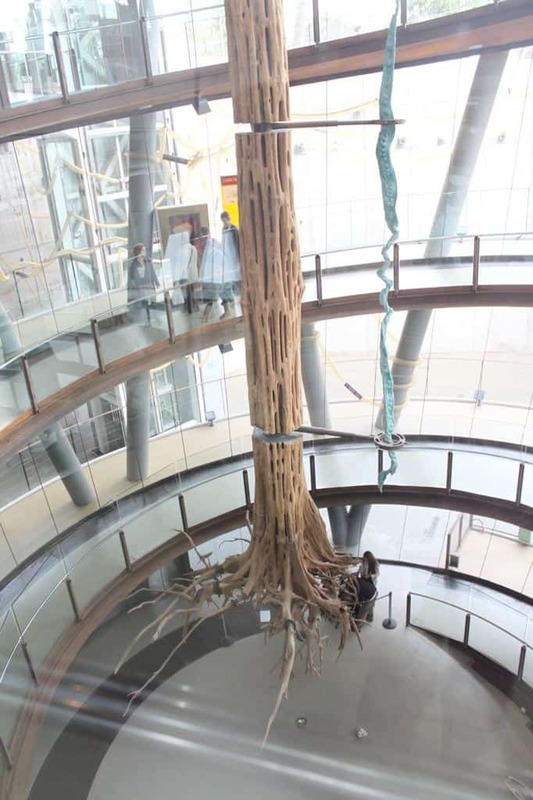 CosmoCaixa is a hands-on science museum run by the “La Caixa” bank community projects. It has a host of permanent and temporary exhibitions, activities, and installations – all designed to help you get your brain enthused about learning science, instead of having it taste like a cardboard box. Cool thing #1. The museum opens up to an extensive plaza, La Plaza de la Ciencia, with lots of room for your kids to run around. It has a few outdoor science installments with explanations – like a sundial, the meteorological station, and the Mediterranean garden. Since CosmoCaixa is not in the busy city centre and higher in altitude, the air feels crisp and clean! Ciencia al aire libre: More fun experiments in the museum’s plaza. So let’s go down, down, down, shall we? The place to start is the spiral staircase that surrounds this Amazonian tree. It takes you all the way to the permanent exhibition, La Sala de La Materia on floor -5. La Sala de La Materia explores four eras: inert matter, living matter, intelligent matter, and civilized matter. And the interactive installations are phenomonal. I don’t know how many we interacted with – possibly 100, and we didn’t catch all of it. In short, you explore matter from the beginning of time to now. Either way, you’ll love interacting with anything and everything you can TOUCH! Science experiment! 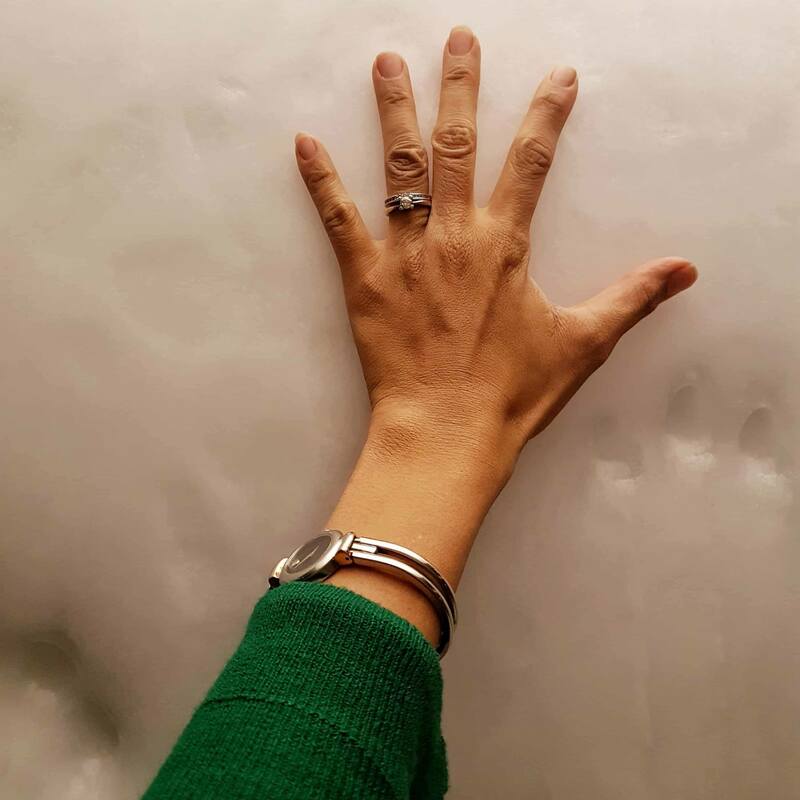 The heat of your hand can transform the block of ice into steam or liquid. We came here to see Trix, the tyrannosaurus rex that was discovered in Montana in 2003 by a Dutch team. Trix is the most complete dinosaur fossil ever discovered (about 80% complete). Dig this mind-blowing fact. (Get it? Dig? I’m so good.) T-rexes lived over 67 million years ago! What the what?! As fourth grade science explains, it’s a fossil, and not the actual bones. The activities that go with exhibition are supercool. They include digitally “spray painting” a t-rex. And riding a bike in virtual reality to see if you can outrun one! AHHH! My favorite: jumping on a scale with your friends to see how many days worth of food you are, based on your weight, to sustain a t-rex. That’s the way to teach science! 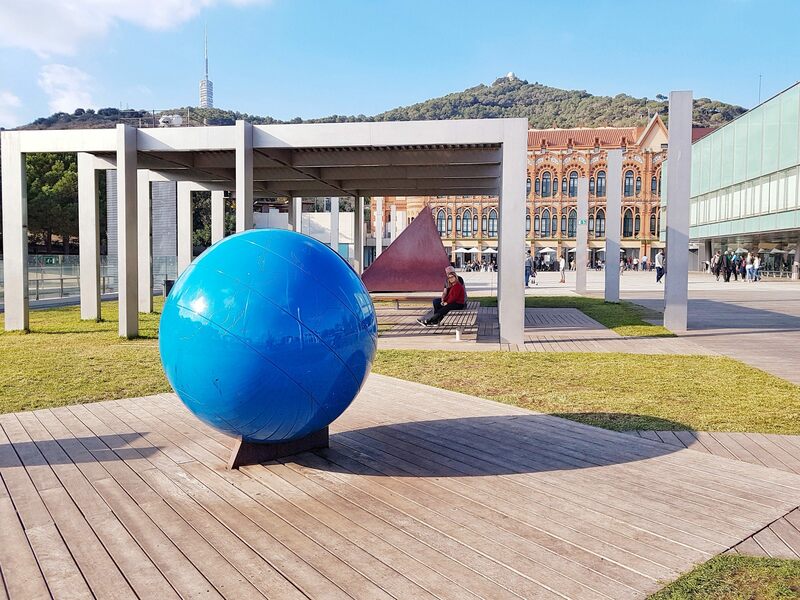 Catch Trix at CosmoCaixa until February 2018. Come see this with your own eyeballs! Inside this Amazon rainforest live 100 animals. I think I saw 27. Do you dare enter? Now, my favorite part of the museum! 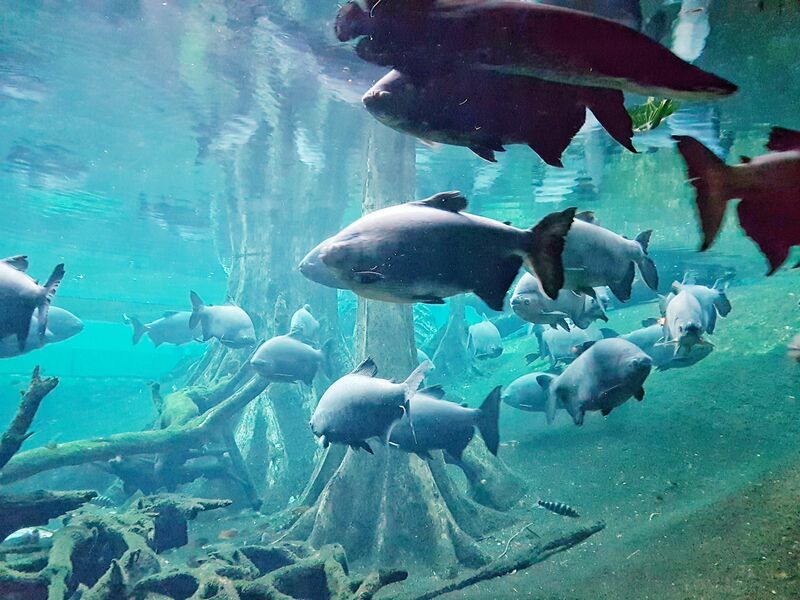 The Bosc Inundant, or the Flooded Forest. This 1,000-meter Amazon rainforest is a replica of this humid ecological environment in a greenhouse. I’m talking boas, tropical birds, boa constrictors, and alligators! It even rains every 15 minutes. 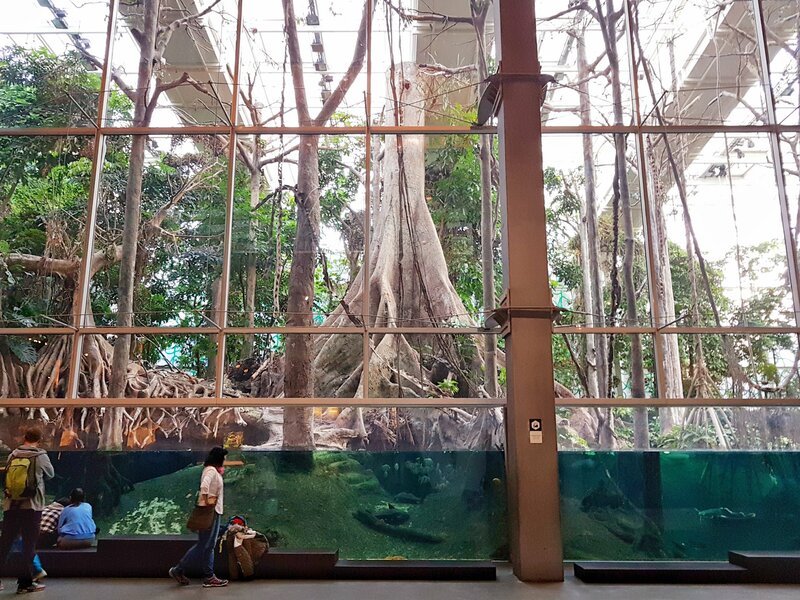 Now, time to take off your coat and sweater, because you can get behind the museum glass and enter into the rainforest. Toca toca. Kids get a chance to touch exotic animals like snakes, spiders, and starfish. They explore the different ecosystems and environments. More here. Clik. For kids ages 3-6. More experiments, but this time with an educator. Kids can experiment with magnifying glasses, mirrors, bubbles, and more. Planetario Cosmocaixa – Kids put on their 3D glasses and sit in a dark theater! Showings vary throughout the year – with the common theme of the sky, stars, and our great big universe. Check out showings here in Spanish. Planetario Burbuja – For kids ages 5-8. Get to know the stars, planets, and constellations and understanding how rotations create days and seasons. The activities and workshops are changing, so check out more here. I came home thinking, did I learn much? I would say yes! For 4 euros, it’s well worth the price and going “out of the way” (for me) to Sant Gervasi. The textures and displays are fascinating. Personally, I enjoyed seeing how fractals, spirals, and hexagons appear in nature. There are truly beautiful nature-scapes found in the most minuscule items – like a wasp hive or the horn of a goat. Or you’ll love to discover how colored light combines to make white light, or how the Foucault pendulum explains the earth’s rotation. Not necessarily. If you love science in general, you’re going to enjoy the interactiveness of CosmoCaixa. 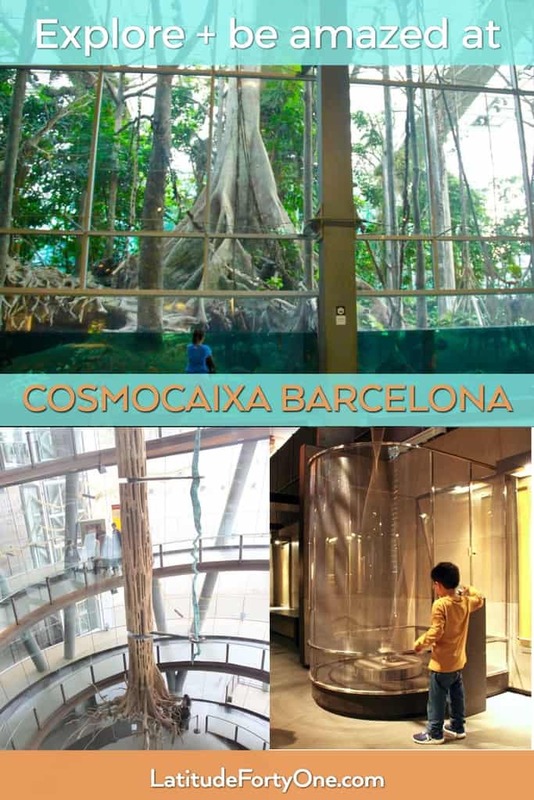 I dare say that it has romantic parts: the flooded forest, the displays of nature, and the outside views of Barcelona! Bring a lunch. They have a picnic area. If it’s a sunny day outside, you will enjoy the gorgeous plaza outside. The Cafeteria. Sandwiches, chips / crisps….you have your basic on-the-go style grub. 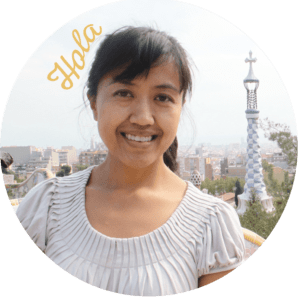 They have indoor and outdoor seating that opens up to the Plaza de La Ciencia, where you can eat and watch your kids while they play. The buffet T-Rextaurant. This is a fantastic option, which we did. It’s a buffet, but a high-quality one. It serves about 8 warm dishes like meatballs, hake, rice, roasted potatoes – all very tasty! Waiters were constantly on hand available for an order or a question. At the end of the meal when you pay, the kids get a toy too! My kids got a small teddy bear keychain that lights up. Schedule at least two hours to stay here. As of today, Google shows that people typically spend 3 1/2 hours here. Me, I was there for 5 1/2 hours! And we didn’t even see everything. If you prefer to go by car, you can park your car using their underground parking. We arrived at 12:30h, and a sign said “Complet” (complete) with 4 cars queueing in front if us. We took the chance and went inside to find at least 20 free spaces. So don’t fret if you see the sign, go inside. CosmoCaixa parking comes with two free hours. Buy your tickets in advance. The line to buy tickets was insane! We bought our tickets online, and we entered right away. See below for a discount! Cost: Kids ages 16 and under, free. Adults, 4 euros. Or click on the button below to buy your advance tickets and get a 5% discount. This is my second time here, and it’s still amazing. And we didn’t finish! I’m considering buying a family membership once my kids are older and have to learn science at school. 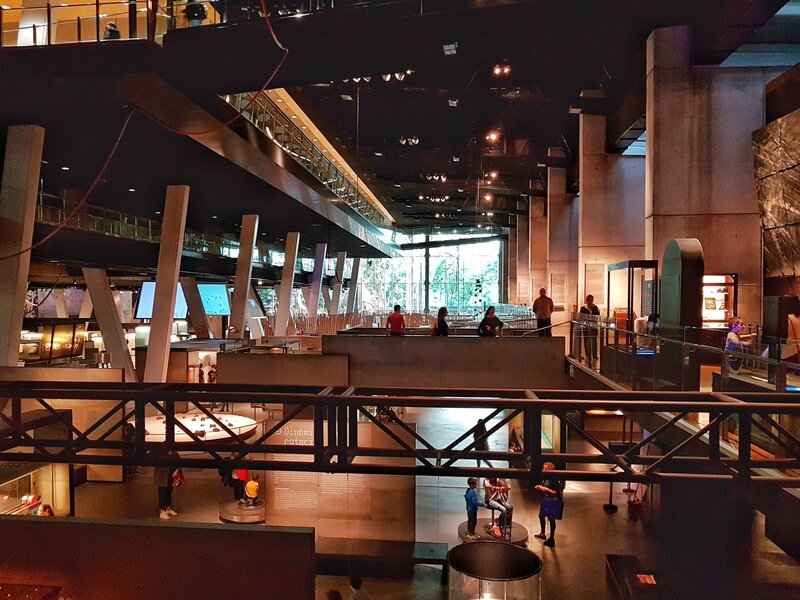 Have you been to CosmoCaixa? What did you think? Would you come here? Do you want to know more? Let me know in a comment or send me an email!